Forty students from Huntley High School were selected by teachers to participate in the Safe School Ambassadors initiative, a national training program that harnesses the power of students to help stop bullying and violence. The training uses a variety of exercises to provide student ambassadors with the communication and intervention skills to prevent and stop emotional and physical bullying. The two-day training, held November 12-13, 2014, marked the first time the program has been implemented at HHS, but it previously had been held at both Marlowe Middle School and Heineman Middle School. According to Shannon Phillips, who teaches AP psychology and sponsors the Chain Reaction Club at HHS, the program is valuable in empowering students to improve the climate of their schools from the inside out. The 40 students selected for the program based on their leadership skills and ability to positively influence different social circles within the school. 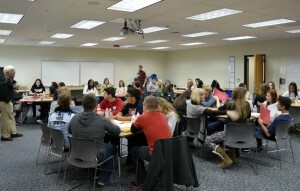 Students were selected from the sophomore, junior, and senior classes, because several HHS freshmen had gone through the training while in middle school. View more photos of the training at the District 158 Facebook page and learn more about the Safe School Ambassadors program www.community-matters.org.